Not sure how to start this, as I've never done this before, so maybe I'll imitate Tizzy (sigh) and just say "Hello World!". I am very excited these days because Michelle Alfonso has finished an absolutely gorgeous cover for my story, Blizzy, the Worrywart Elf (as told to Dorothea Jensen). I will post a sketch of it on our Pinterest account ASAP. (http://pinterest.com/izzyelves/pins/) But first let me say, that I am not and never have been a worrywart. That's just what the elves in my section (the Izzy Section) of the North Pole called me when I was trying to track down Tizzy when he was missing one Christmas morning. 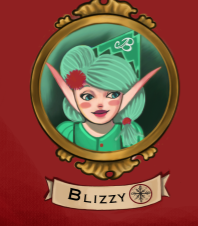 I tried to talk Deedy (that's what we elves call Dorothea except when we are irritated with her) into making the title Blizzy, the Exceptionally Clever Girl Elf, but she said that would give away too much about the story. Oh, well. I guess I must bow to the demands of literary composition. But it is my story. Meanwhile, I was delighted to have Tizzy safely back at the North Pole again. However, I must admit he can't seem to say enough (by that I mean he talks a bit too much) about his new heroes, Owen and Alex. They are the two big guys (well, they are big to an elf, apparently) who figured out how to get Tizzy home. Frankly, I shudder when I think of their first two tries, which seemed a little too dangerous to me! Poor Tizzy! First he was sick and then he was scared out of his wits! So glad those boys finally thought of a safer way to help Tizzy get home again. (Although those boys apparently had a couple of bad moments when they thought Tizzy might have been thrown into the f— oops, no, I'd better not tell you. That would give away too much. Now it seems that Dizzy had his own Adventure last Christmas. He's not saying much about it to the rest of the Izzy Elves. He says that Santa Claus (S.C. to all of us) has sworn him to secrecy for the time being. I wonder how S. C. would feel if he knew that Dizzy has been yakking away to Deedy about whatever happened last Christmas. He says she has the story all written down now. I imagine she is negotiating with Santa to get permission to publish it. I think it's called Dizzy, the Stowaway Elf, but that can't be right. Seems to me that this title gives away too much of the story. But nobody asks me for literary advice, even though I am Blizzy, the Exceptionally Clever Girl Elf. If you want to find out more about my story, or Tizzy’s story, or maybe even Dizzy's story, or our friend, Deedy, go look on her website: dorotheajensen.com.